You may recall our post about the $400 million Airbus A380 commissioned by an Arab oil magnate, where $100 million of that was spent just on the giant jet's interior. Now we have three a picture of the inside of that flying palace created by jet interior expert Edése Doret, who put together the spectacular innards of this aircraft that will have two dining halls, a 600-square-foot master bedroom, game room, a whirlpool tub and a whole lot more. Pictured above is a relaxing area for business meetings and general partying, and many of those seats can be converted into beds. 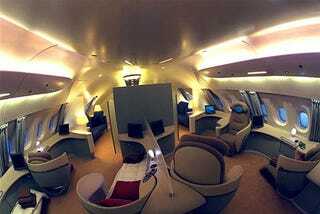 Click through the gallery below for pictures of its huge board room and a luxo-sport bar for carousing at 35,000 feet, as well as generic pics of the Airbus 380 exterior. We just want to see a picture of that 600-square-foot master bedroom with its miraculously quick draining whirlpool tub. Update: The picture of the dining room/boardroom in the gallery is designed by Edése Doret, the others are possible designs for the Airbus A380 created by Lufthansa Technik.